Frasier Crane never gets what he wants because Frasier Crane is a horrible person. Amanda is in her first year of a new city, Chicago, binging on television on the internet, and suspects she may also be a horrible person. Frasier Crane keeps grudges about stolen salt cellars. Amanda signs up for free online budgeting software. Frasier Crane is un-romanced by the innocent preciousness of a Dalmatian puppy. Frasier Crane always has one foot on the proverbial floor, even as he is in bed, romancing another perfectly adequate conquest, often blonde. Twenty-two minutes is enough time to reveal her inadequacy or his. Also, Frasier Crane says words like “proverbial” often. Amanda has lots of conversations with her husband, about lots of different things; often as her partner he seeks to counsel; they sit in their eat-in kitchen and talk about where she can look for a job next, how much happier she is when teaching, whether her novel will ever get published. Amanda suspects she could be a better partner. Frasier Crane is not happy with his stateroom, on his tropical cruise. Amanda looks in the refrigerator and wants anything not in it: wants diet sodas and premixed cocktails, convenience foods with minimal preservatives, local cheeses with vegetarian rennet, fats and salts and starches and sugars; even starfruit, which is beautiful to look at but in the mouth challenging texturally and not even so flavorful. Frasier Crane suspects he is a descendant of Russian royalty. Amanda talks to her mom on the phone, asks her if she is happy. Her mother says yes, but Amanda wants to know (but does not ask) what happiness entails for her. Frasier Crane gets parked in by his upstairs neighbor’s Hummer, and calls an emergency condo board meeting. Amanda has her car stolen, but now she does not have to worry every time she hears a car alarm. What it is, is one less anxiety. Amanda receives an email thanking her for her interest. Frasier Crane’s unconscious mouthing of the word “hermeneutic” costs his son Frederick Gaylord Crane the National Spelling Bee title. Amanda’s friends have jobs so they do not always have time for “work dates” at local coffee shops, like they used to, all the time, during graduate school. Frasier Crane commits a Federal crime by stealing his neighbor's mail, and, upon reading not-his intriguing letter, contemplates also stealing his neighbor’s identity. Amanda’s husband calls her from his lunch break to let her know that he’s mailed their wedding thank you notes: Pantone postcards bedecked with tiny, thoughtful, and incredibly belated gratitudes. Frasier Crane lives with his father, the Korean War Veteran/Retired Police Officer, who watches sports on television. Customarily Frasier Crane only watches operas on PBS, but once, during a real dating drought, Frasier Crane was riveted by the broad charms of Wheel of Fortune. Amanda watches television as a hobby, really, but is less siren’d by the “new” television, its mood-making cinematography and spoilers hot as a blacking iron. She is interested, rather, in the middle-of-the-road, the middle-old, the also-rans. Frasier Crane wears Armani and Zegna and bespoke tailoring. Amanda makes sure to put “real people” clothes on every day, even if she does not plan on leaving the house. Sometimes her husband comes home late from work and she already in her pajamas; he could be excused for thinking she never took them off. Frasier Crane is told by a date: he is not different from all the other jerks out there. Frasier Crane, having eaten all of his date’s ravioli in order to sooner devote his attention to a more attractive prospect sitting two tables over, has no choice but to agree. 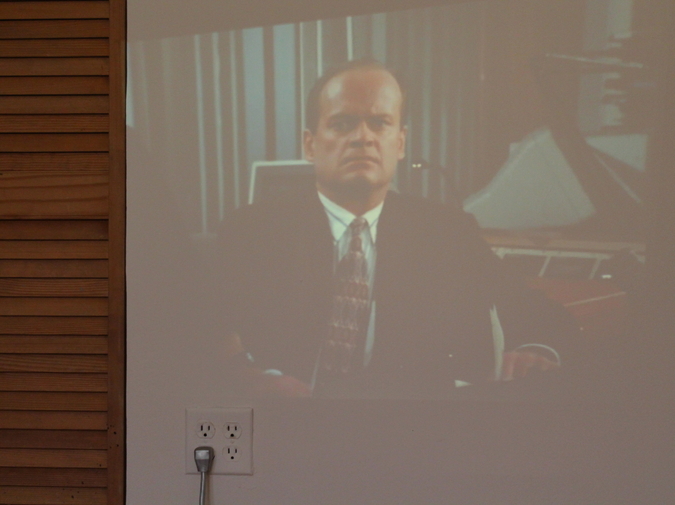 Amanda watches Frasier, every day for weeks. There are eleven seasons and its jazzy interludes accompany her as she unloads the dishwasher or puts away laundry. It acts like an alternate life: Seattle in the 90s, sans any trace of grunge, a neoclassical situation comedy that is socio-culturally bullheaded and politically unconcerned, where everyone is without children or with children mostly off-screen, a gang of self-obsessed adults in their thirties and forties and sixties, auras the color of “tofu” and “putty” and “oatmeal” and “almond” and “harvest wheat” and “buff.” Amanda watches Frasier and wears black and watches makeup tutorials on the internet about how to correctly blend eyeshadows. On the train she sees teenagers in nineties drag. She, too, used to own Doc Martens. Frasier Crane’s BMW 7-Series is in the shop. The seat warmers are stuck on high. That is not a joke. Well it is a joke, but not in the context of the scene. In the context of the scene it is simply another inconvenient truth in the life of Frasier Crane, who never gets what he wants. “Do women think Frasier is handsome?” Amanda’s husband asks. She says no, and not charming either. He’s a windbag, he’s a misogynist, he’s un-hip and un-rigorous and odious. “Why do you watch this, anyway?” he asks. She cannot say. She has spent much of her life actively avoiding its broadcast. Really: used to be she wouldn’t even let her husband sing the Frasier theme song, (the title, inexactly lascivious: "Tossed Salad and Scrambled Eggs") while he was actually making them scrambled eggs. Then, one day, it seemed like the right idea, as if Frasier had been waiting for Amanda the whole time, some local unrequited love. Frasier Crane feels it’s time to settle down; Frasier Crane catches the eye of a pastry chef, an art collector, a swimsuit model-turned zoological doctoral student. Frasier Crane does not, however, settle down. Instead he hoodwinks and is caught, and is left alone with those salt cellars which have not been stolen, and all the other un-stolen gewgaws, and all the other functionally childless people. Amanda is 31, and in the really important part of unknotting adulthoodness: the what-has-happened, the what-will-not-happen, where-I-am, where-I-am-not, the mapping of all of it. A reckoning. No longer really truly young! And not yet working to win a fight over regret. A thought she has recently had is that she may not be legitimate to anyone else until she is legitimate to herself. Frasier Crane does not win the SeaBee for the third year in a row. Of course these excellence-in-radio-broadcasting judges always make the “wrong” decision. According to Nielsen, the average American adult will spend about nine years of their life watching TV. The thought makes Amanda want to vomit. But will it stop her from watching? Nope. Frasier Crane’s bicoastal child-of-divorce Frederick signifies puberty by having his grandfather switch the channel to MTV. “I’ve never seen such dancing,” his grandfather the Korean War Veteran/Retired Police Officer says. “What are those shorts made of?” Frasier Crane asks, walking in. “Some kind of silver mesh?” The older generations watch on television the proclivities of the youngest, newest man in the house, are bemusedly horrified. Amanda wonders whether “silver mesh shorts” are a thing she could “pull off.” She thinks, no. Anytime she is out at night lately, at a bar or show or opening or movie, she realizes: she no longer dresses like she once did, the way the younger people around her dress, in statement pieces and ill-fitting pants, and with visible bra straps. Once at 23 Amanda paraded around a New England town in an Apple Bottoms-brand red jumpsuit just to let tourists stare and at the time this seemed like a perfectly acceptable summer Saturday activity. Frasier Crane gives his son’s bar mitzvah blessing in Klingon, accidentally. All of her life, Amanda’s mother has said that 30 was her favorite birthday, and that every one after was even better. Frasier Crane is mistaken for a homeless man while taking out the recycling, by an old high school buddy, just hours before the high school reunion which he has decided not to attend. Life has been not so great for Frasier Crane, but it is not so bad that he is homeless or even needs to cut back on sherry. But now, in order to prove it, Frasier Crane needs a date for the reunion! After a panel discussion about the contemporary historiographic narrative of Chicago architecture Amanda is drinking free chilled white wine out of well-designed stemless glassware, and feeling loose. She stands congenially among stylish Saturday-dressed architects, her husband among them. “What are you doing with yourself?” asks one or another. “Freelancing,” Amanda says, which she understands by now is the way to say unemployed without evoking some uncomfortable, well-meant homily. Later on the way home her husband says, “You’re usually so bashful to take advantage of free stuff.” “I just,” she says, a little tipsy, “want to make sure everybody who wants some gets some." Frasier Crane’s agent chain smokes and wears power suits and appears to have only him as a client. Frasier Crane’s agent wants him to host a morning talk show, be in a cooking contest opposite a monkey. Frasier Crane is not having it. Amanda, at 31, is a horrible person in the way that most of us are horrible people: she is not at all times gracefully appreciative for the chaotic magic of what-is-life. She does not always see the many riches she has. To distract herself from seeing that she is not getting everything she’d thought she’d have by now, she watches Frasier and obsesses over the weather. She makes small talk with people who work registers. She can make small talk about anything, but especially weather! “Did you see that? A character in this movie just dialed a phone and at the exact same time our phone rings. It’s like Montgomery Clift’s calling me,” says Frasier Crane’s father, the Korean War Veteran/Retired Police Officer. Frasier Crane is not listening. Frasier Crane does not appreciate the delicious coincidences of life! Amanda at the end of Frasier is 31; winter is giving up, and so hibernation is no longer excusable. When finally, after the long cold there is a beautiful day, whose warmth licks so sweetly at the tender crocus stalks? When finally, after winter there is a beautiful day, so beautiful it heats Chicagoan cockles and people at last do something more than grimace like teenagers? When finally, after winter, there is a day so beautiful that the red buds burst into blossom and barbecue smoke invokes skyscraper-high memories of backyard parties and sips of beer, of being younger and youngest and when rolling down a hill was a halcyon errand of acceptable ego? Oh Frasier Crane, will you explain to Amanda we cannot hope for what we had once, nor what we thought we’d have by now? No you can't, for Amanda is a horrible person, for she only wants another day as beautiful as this. Amanda Goldblatt lives and writes and watches TV in Chicago. More at amandagoldblatt.com.